1/19/2019 Lewiston UT Lana McKee 801-518-9860 All 9 Events. 2/8-10/2019 Edna TX YRA Vegas Tuffest Qualifier Breckinridge Complex Mary Meyer 713-501-8843 All 9 Events. 2/18/2019 Southwest Ranches FL Amanda Weekley 954-805-2528 All 9 Events. 2/23-24/2019 Billings MT Big Sky LBR #1 Millers horse Palace Robert Howell 406-690-5380 All 9 Events. 3/15-17/2019 Gonzales TX YRA Vegas Tuffest Qualifier J.B. Wells Arena Mary Meyer 713-501-8843 All 9 Events. 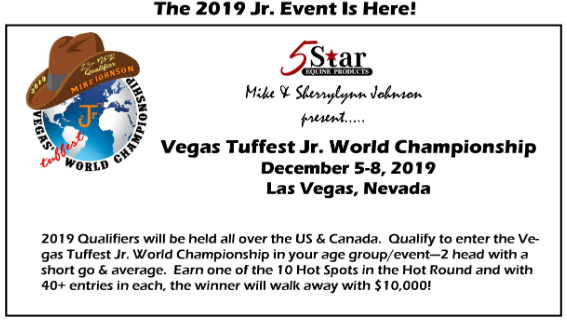 3/23/2019 Maricopa AZ AZ Vegas Tuffest Qualifier #1 Wayne Warkentin Arena Tammy Kelton 602-538-8823 All 9 Events. 3/23-24/2019 Billings MT Big Sky LBR #2 Millers horse Palace Robert Howell 406-690-5380 All 9 Events. 3/30-31/2019 Brenham TX Generation Next Jr. Calf Roping Lawrence McCullough 254‐424‐4095 All 9 Events. 3/31/2019 Stanfield OR Wild Bunch Ranch Wild Bunch Ranch Brad Goodrich 541-980-8488 All 9 Events. 4/14/2019 Brownsburg IN Circle T Katie Hayes 317-796-6422 All 9 Events. 4/26/2019 Calmar AB CN Alberta Tuffest Jr. Qualifier Wayne Warkentin Arena 27259 Twp 490 Calmar AB CN Wayne Warkentin 780‐850‐8768 All 9 Events. 5/12/2019 Ceres CA Way West JR. Timed Event Championships 6055 Central Ave. Ceres, CA 95307 Chad Parson 209-277-7448 All 9 Events. 5/18/19 Prescott AZ Vegas Tuffest Jr Qualifier Prescott AZ Arena Tammy Kelton 602-538-8823 All 9 Events. 5/22/2019 Morden Manitoba CN Rocking W Ranch Dusty Van der Steen 204-750-2483 All 9 Events. 5/25/2019 Colfax IN Shawn Coleman 765-650-1321 All 9 Events. 5/27/2019 Spanish Fork UT Memorial Day Vegas Tuffest Jr. Qualifier Spanish Fork City Fairgrounds Main St. Spanish Fork, UT Zane Dansie 801‐599‐1238 All 9 Events. 5/31-6/2/2019 Lubbock TX Texas Tech Jerrad Hofstetter 903-316-4136 All 9 Events. 6/02/2019 Mechanicsville VA Dun Roamin Arena 9225 Rodeo Dr. Mechanicsville VA Brandy Slaughter 804-380-0160 All 9 Events. 6/5-6/2019 Heber City UT Heber City Jackpots Provost Arena Whittney Wiberg 801-875-3659 All 9 Events. 6/7-9/2019 Pawhuska OK Oklahoma Tuffest JR. Calf Roping 628 Kiheka Ave. Pawhuska, OK Amber/Jerry Hurst/ Joe O'Rourke 918-440-6484 / 918-637-1509 / 918-759-1113 All 9 Events. 6/08/2019 Okeechobee FL Southern Most Junior Calf Roping 2901 SW 24th Ave. Okeechobee, FL Joanna Sherman 863‐634‐3265 All 9 Events. 6/22-23/2019 Brenham TX Generation Next Jr. Calf Roping 1305 E. Blue Bell Brenham, TX Lawrence McCullough 254‐424‐4095 All 9 Events. 7/4-5/2019 Tulsa OK Vegas Tuffest Jr World Championship Qualifier (AQHA Summer Circuit) Mustang Arena Tulsa Expo Cara Walker 405-880-2751 All 9 Events. 7/26-27/2019 Bowman ND Ty Tuff Challenge Bowman Winds Arena Stacy McGee 701-523-6996 All 9 Events. 8/2-4/2019 Okeechobee FL Southern Most Junior Calf Roping 4200 State Rd. 70 E Okeechobee, FL Joanna Sherman 863‐634‐3265 All 9 Events. 8/3-4/2019 Brenham TX Generation Next Jr. Calf Roping 1305 E. Blue Bell Brenham, TX Lawrence McCullough 254‐424‐4095 All 9 Events. 8/11/2019 Ceres CA Way West JR. Timed Event Championships 6055 Central Ave. Ceres, CA 95307 Chad Parson 209-277-7448 All 9 Events. 8/16-18/2019 Ignacio CO Tres Rios Jr. Roping 200 CO-151 Ignacio, CO 81137 Brett Tatum 325-248-4051 All 9 Events. 9/2/2019 Rosthern SK Canada Vegas Tuffest Fall Qualifier Rosthern Arena Lawrence Gaudry 306-213-7444 All 9 Events. 9/6-8/2019 Elbert CO Vegas Tuffest Qualifier Latigo Trails Equestrian Event Center Greg Magee 720-450-1485 All 9 Events.